Former Prime Minister and former Maoist ideologue Dr Baburam Bhattarai announced that he will launch street agitation demanding to scrap hydropower development agreement with Chinese Company. After handing over memorandum to Prime Minister Sher Bahadur Deuba urging him to scrap Budhigandaki Hydropower Project Construction agreement signed recently with Chinese Company, former Prime Minister Dr. Bhattarai warned that he will not hesitate to take any decisions against this agreement. 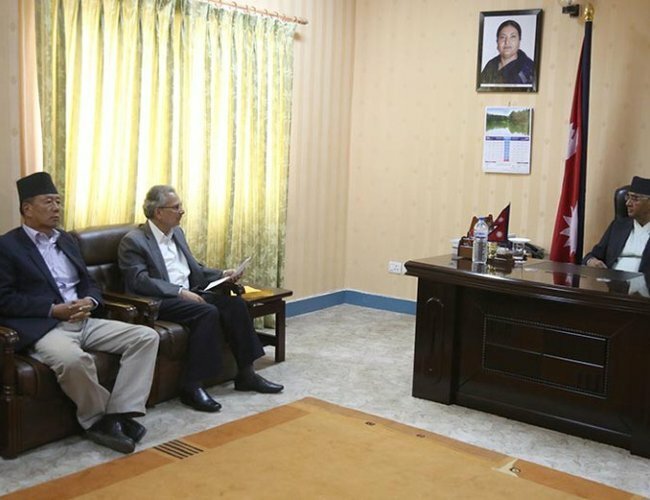 “There is no way other than to scrap the decision made by the previous government on May 24, 2017 to hand over the project to a Chinese company,” demanded Dr. Bhattarai.” Prime Minister Deuba has taken his demand seriously. In 1996, Dr. Bhattarai also handed over a Memorandum to PM Deuba and launched bloody Maoist insurgency which killed more than 15,000 people. copyright © 2014 nepaltoday and gorkhaexpress. All rights reseved.